The typical cycle of deploying predictive models can be an error prone, labor intensive, multi-step approach that can take weeks or even months to complete – and at the same time costing organizations tens to hundreds of thousands of dollars. Alteryx Promote provides an end-to-end data science system for developing, deploying and managing predictive models and scoring data with real-time decision APIs. It allows data scientists and analytics teams to build, manage and deploy predictive models to production faster — and more reliably — without writing any custom deployment code. Alteryx Promote makes deploying a predictive model easy with the click of a button regardless of your skillset. Delivering R and Python models is immediately accessible via standard REST API requesrs without recoding or utilizing the code free environment of Alteryx Designer to build and deploy models. Embedding models into production apps is as simple as sending an auto-generated code snippet to your dev team. Embed predictive models in any application capable of making REST API requests. Execute real-time predictions in low-latency applications or use batch mode for bulk offline scoring. Alteryx Promote allows users to manage the entire deployment process to ensure that models deployed to production work as intended to improve business performance. Ensure you are working with the most recent model through version control and tracking to facilitate organized collaboration. Deploy a new model via a hot-switch or roll-back to a previous version with the click of a button. Confirm that your source code operates properly with automatic unit testing before deployment. Unit test new models without interfering with existing models running in production applications. Alteryx Promote lets users monitor the performance and health of their production-based models to ensure the effectiveness of the models. Access traffic and summary statistics of models running in production. Pinpoint and resolve model errors with speed and precision. 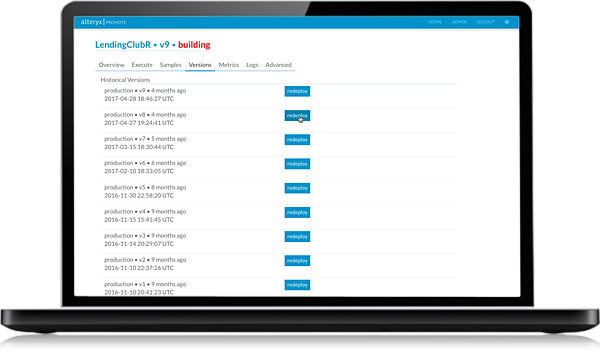 Monitor the stability of your models and servers in real time. Alteryx Promote ships with a variety of system and model checks in one centralized view. *Alteryx Connect, being a focused on modern tools, is optimized for browsers like Chrome, Edge or Firefox. However, the Alteryx Connect technology is compatible with IE11 and there are no known major problems accessing Connect from IE11.